Across a trial table in Cleveland's Common Pleas Court last week two aging tycoons, once inseparable friends, faced each other in bitter litigation. Plaintiff was tiny (5 ft. 3) Frank A. Seiberling, board chairman of Seiberling Rubber Co.. keen and dapper despite his 80 years. On the other side was mystic, eccentric, 275-lb. Edgar B. Davis, 66, oil & rubber man, who has made and spent four fortunes, given away some $6,000,000 to charity and friends because he believed his money "came from the good God himself." When the pair first met in 1912. Frank Seiberling was the head of Goodyear Tire & Rubber Co., which he had founded; Edgar Davis was managing director of U. S. Rubber Co.'s vast Sumatra plantation. They found they had a common dream: enough U. S.-owned plantations to smash the Dutch-British rubber monopoly. Before they could do much about it, Rubberman Davis left U. S. Rubber Co. with a $2,000,000 fortune, which he proceeded to give away and to pour down a series of dry holes in the oil country around Luling, Tex. A $57,000 loan from Friend Seiberling tided him over until his North & South Development Co. struck oil at a spot he was sure Divine Providence had picked for him. In 1926 he sold his oil properties for $12,000,000. With his new riches, Oilman Davis was able to play turnabout for his friend. Having endorsed Goodyear's notes in the 1920 panic, Seiberling, with personal debts of $6,665,000, was ousted from control of his company by Dillon, Read & Co. He quickly formed a new firm, Seiberling Rubber Co., and a holding company, Prudential Securities, Inc., into which he put all of his personal assets including 128,000 shares of Goodyear common stock. Prudential borrowed heavily from Cleveland bankers, one of whom, says Seiberling, "was seeking to crush me." The notes came due. That was Davis' cue. He wrote out a check for $500,000, got a year's extension on the notes [perhaps as presented in the Seiberling legend in which F.A. pays off bankers with moneybags of cash] which he guaranteed, thereby (he [Davis] claims) buying Prudential's assets by assuming its liabilities. Meantime, able "F. A." was deftly maneuvering his new rubber company from 330th to seventh (now eighth) place in the industry. He paid off Davis' loan and, when Prudential's notes again came due, got Cyrus Eaton to put $5,000,000 into a new holding company, Ohio Goodyear Securities Co., which acquired Prudential's assets, paid off the bankers. Most of the Goodyear stock was swapped to Eaton for U. S. Rubber stock, other assets were sold, Eaton was paid off all of Ohio Goodyear's stock was transferred to Davis. Throughout most of this fiscal backing and filling Davis was busy practicing his theosophic belief that because Divine Providence had led him to money it was his holy duty to spend it. In 1926 he backed a Broadway play, The Ladder, for an old playwright schoolmate. Believing in its theme of reincarnation. Angel Davis stubbornly kept the play (a flop) going for two years, eventually admitted the public free. The whim cost him a cool $1,300,000 before he had had enough. Going back to Texas to drill for more oil, he watched the last of his capital disappear into his pet "deep oil" holes. There is a legend that in answer to a cable from Davis in Singapore asking the depth of the drill bit in his latest well, a Davis driller recabled: "You ought to know; you're closer to it than we are." By 1935 Davis was virtually bankrupt. But by this time Friend Seiberling was in no shape to help. His rubber company had first needed rescuing in 1930, when it sold $3,100,000 in debentures. When these came due, "F. A." managed to win an extension from the banks by collateralizing Ohio Goodyear's U. S. Rubber stock. In 1938, with $2,350,000 of the debentures still unpaid, the banks foreclosed, selling about $2,000,000 worth of the collateral. Whereupon Seiberling (TIME, Jan. 9, 1939) bought the debentures at public auction, paying about 30 on the dollar, and putting Seiberling Rubber Co. back on its financial feet. This sleight-of-hand maneuver split the friends for keeps. For Ohio Goodyear, to Davis, was the vehicle in which their "divinely inspired" plantation vision would be consummated. But Seiberling found it handier as a vehicle for rescuing Seiberling Rubber. Despite its costly rescue work, Ohio Goodyear still has 10,500 shares of U. S. Rubber, over $300,000 in cash (held and managed by the Chase National Bank). But the garlands of friendship that bound its coffers are in shreds. Seiberling is now suing Ohio Goodyear to get the rest of its assets, of which, he claims, Davis was never really owner, but trustee. But Davis denies that his original generosity in backing Seiberling (by taking over Prudential's assets) was as unworldly as all that. His notion: if he was trustee, it was for their "common dream"rubber in Sumatrawhich Seiberling has lost. Last week [in June, 1940] the ex-friends were in court over Ohio Goodyear's assets. At recess they sometimes passed the time of day, but that was all. The friendship was as dead as the dream. 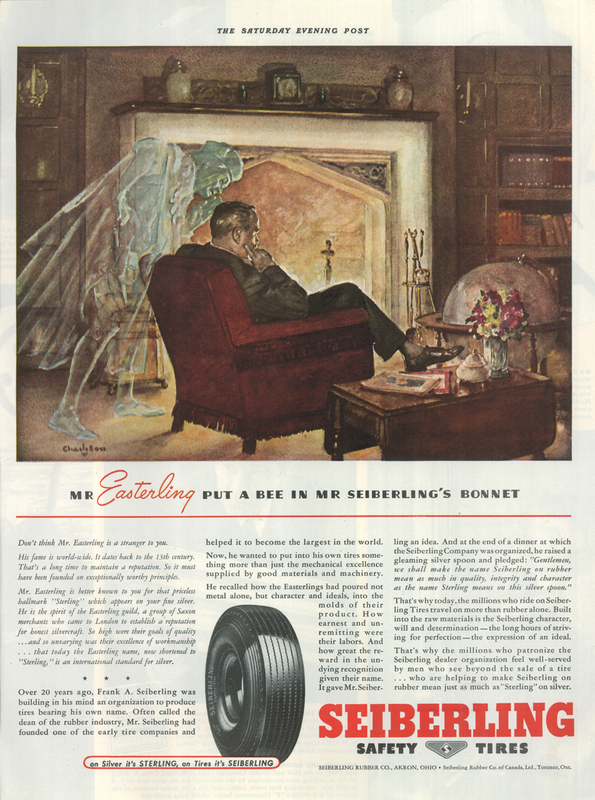 The Seiberling brand was a familiar fixture in print media in the 1940s.